Usually priced at $199. In MARCH, it's MADNESS at $175 - good until the MADNESS ends. Don't miss out. A great gift idea for girls and women of any age, for mom, your wife, girlfriend, daughter, sister or mother-in-law, and it's also a good idea for all occasions: birthday, valentine's day, anniversary gift, holiday gift, Christmas gift. 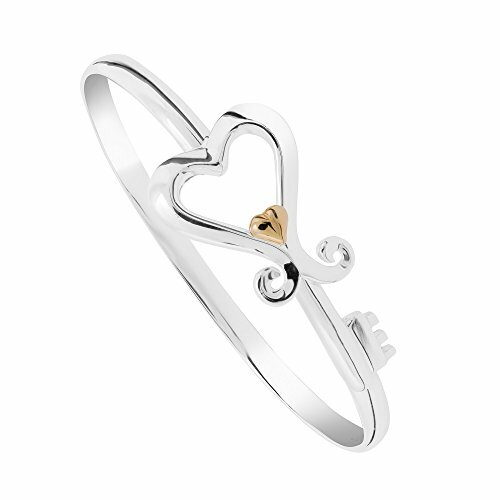 Polished Sterling Silver bangle with interlocking 14k Solid Gold heart. Interlocking Hearts that symbolize your love for each other. The gold heart in the center represents your key to her heart. Simply stated, two Hearts shall be as one. Designed by our Independent Jewelers Organization (IJO) Multiple Award Winning designer, Terry Quinn and made in the USA. Candy and flowers last a few days; give her this heart bracelet, it will last a lifetime. Wrapping: Every bangle is packed in it's own box ready to be given to your loved one. If you have any questions about this product by TMQ Creations, contact us by completing and submitting the form below. If you are looking for a specif part number, please include it with your message.